Classic supply and demand tell us that college tuition will continue to rise faster than inflation. I went to a small southern private liberal arts college, and the total cost of a year for tuition, room, and board was approximately $22,000. Next year, my alma mater will charge incoming freshmen $36,000. That is a 63% increase in only ten years and equates to a 5% annual rate increase. According to the College Board, a not-for-profit membership association comprised of more than 5,400 schools, colleges, universities, and other educational organizations, the national average cost for a year of education at a private four-year college costs $25,143 annually (up 5.9 percent from last year) and $6,585 for a public four-year university (up 6.4 percent). You might not think that 5 or 6% annual increase is much, but it really adds up when inflation hovers around 3% annually and Americans’ real wages are barely increasing by 1% every year. Our wages are not keeping up. Do you realized that a college graduate who has a baby soon after graduation will have to pay approximately $79,000 a year for private college and $22,700 per year for a public institution when their kids enter college twenty years down the road. But, why is the cost of education in America skyrocketing too much? Supply and demand of course! The Supply Curve. For the most part, there are no more major colleges being formed in America. Now granted, there are a few online universities that have been started over the past few decades, but it is safe to say that there will not be any new brick and mortar large schools to compete with the likes of the University of Georgia, FSU, Harvard, etc. There is a finite number of colleges in the US. The market for brick and mortar institutions of higher education is pretty well saturated. Now, many schools are enrolling more students each year, creating larger class sizes, and higher student to teacher ratios. But, even this gimmick can only go on for so long. My own college commissioned a study that at 1,500 students, the quality of education would diminish. So, they chose to stop expanding. So, the supply of education spaces for new freshman each year is staying the same. Classic finance tells us that when supply stays constant with increasing demand, prices will increase. The Demand Curve. So, since supply is fairly constant, that leaves us with the demand side of the equation. The demand to earn a Bachelor’s Degree is huge now. More and more high school seniors are going to college or feel the need to go to college than ever before. 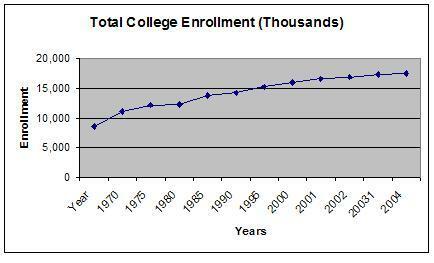 According to the National Center for Education Statistics, college enrollment in increased by 16% between 1985 and 1995 and at a faster rate (23%) between 1995 and 2005, the last available date for data. Studies have shown that college educated citizens can earn up to 60% more over their lifetimes than their high school diploma only counterparts. And, let’s face it. Our world is not getting any cheaper. Unfortunately, many graduating high school seniors view that they almost have to earn a Bachelor’s Degree to keep up in the new work force. New Paradigm. There has been a fundamental shift in our collective thinking. Now a Bachelor’s Degree is almost expected by our society. A Bachelor’s Degree is now the new equivalent to a high school diploma. More and more jobs in America require a degree where originally a GED or high school diploma would have sufficed. Now, a Master’s of Science degree is the new Bachelor’s Degree. Everything has shifted. Part of the reasoning is the shift in America’s competitive advantage. The US is no longer blue collar despite what people and the unions want us to believe. We outsource textiles and other once dominant hard working industries. And, the US assembly line jobs which we invented and made prominent are all slowly being phased out as well. We can all see that case every day in the news and in Detroit especially with the Big 3 auto makers. What Is A Parent To Do? Stay tuned. Over the next few days I’ll talk about a few possible solutions to help us fund the education of our children. Great explanation of what is going on. I just wish there was something to counter the trend. One thing is to better educate high school students and other displaced workers that there are some very good paying trades that do not require a degree. FYI, I added a link to this post on my site. This analysis does not consider the “supply and demand” of dollars to pay for college. If Federally backed funds, through student loans and other programs decline, then doesn’t it stand to reason that the supply of dollars to pay the higher cost of college will decline, thus leaving empty seats in schools that have expanded capacity? Since the schools have already expanded, by building new buildings, adding to staff, adding housing … all these resources would potentially decline in use, which should put pressure on the schools to effectively lower tuition by offering more discounts or subsidies. As mentioned in this article, tuition costs are projected to rise faster than inflation and education could become increasingly difficult to afford. However, alternative options such as credit-by-examination can both help students meet the current rising prices and perhaps create an influence for schools to reduce them in the future. Accredited colleges like Thomas Edison State College accept up to 95% of coursework through tests such as College Level Examination Program (CLEP) and DANTES Subject Standardized Tests (DSST) exams. This allows a college student to study the required material and test at an approved location to earn credit hours for a fraction of traditional costs. In addition, tuition assistance is available such as the Post-911 GI Bill for military personnel.